So I used to go to this coffee shop that put out these cool little stickers with quotes on them. 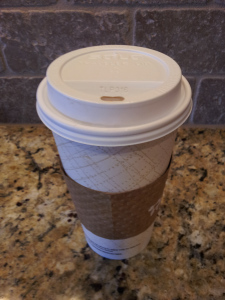 (You put on top of the mouth hole of your to go cup lid so it doesn't spill in the car.) Well, the coffee shop has since gone out of business and now I don't get those cool little stickers with the inspirational anecdotes on them any more. However, I will still find some short quotes to continue my coffee sticker quote segment. I think he hit it right on the head. That is the biggest problem these days is many people want change but they are not willing to do anything about it. Or, they think someone else is going to do it for them and give them change. Why are we afraid to change things in our lives? Is it that we get comfortable in our surrounding? Is it that we are afraid of the unknown? Is it that we think we are immobilized to change something in our lives? It could be all of those things and more. If you are unhappy about the way things are going in your life. Or, if you are unhappy with your job, career, relationship, money, finances, the economy, government, or other life situation you do have choices. There are three things you can do in life about the situations you are in. SUFFER: You can stay in your situation. If you stay, and not change anything, then it is your choice to stay and suffer. If you choose to do this, then stop complaining about things. You made your choice, no one forced you to stay. LEAVE: Leaving is a form of change. You can always leave. Move jobs. Leave your relationship. If you are unhappy with the government, you can go to a different state or country. If you don't like your friends you can find new ones. Remember, if the problem is with you, then your problems may follow you. CHANGE: You can change your thoughts, actions, beliefs, or way you do things. If you are unhappy with government, get involved to make a difference. If you are unhappy with the economy, change your spending or think up new ways to make money. If you are unhappy with a relationship then find a way to change it up. Change is all up to you. Like Tony Robbins says above, nothing changes if you do nothing.